Chronic pain can drag you down but there are ways to lift yourself up. 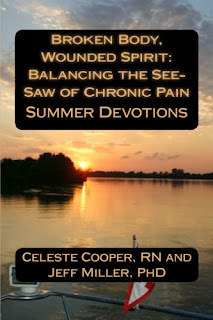 Broken Body, Wounded Spirit: Balancing the See-Saw of Chronic Pain by Celeste Cooper, RN, offers sublime encouragement and innovative tips for healing. Ninety-two daily readings have a beautiful or peaceful photograph to accompany a famous quote or words of wisdom. This book is called Summer Devotions which is a season for growth in nature and, hopefully, in your life and health. 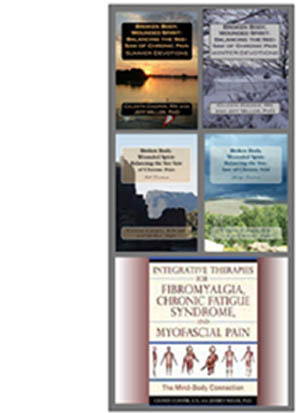 There may be deep meaning in the experience of chronic pain which goes beyond invisible and nagging symptoms. There is a Chinese proverb which says, "The gem cannot be polished without friction, nor man perfected without trials." The hidden gem of value within ourselves can be understood by practicing meditation, breathing deeply, or focusing on prayer. Topics for Summer Devotions include: Ten tips for overcoming depression, focusing on outcomes instead of obstacles, suggestions for visualization, finding your inner strength, better nutrition, and spirituality. Registered nurse Celeste Cooper and her co-author psychologist Jeff Miller, PhD, don't minimize the experience of chronic pain and they show many ways to find balance in your life and health. The quotes and coping methods have both Eastern and Western sources. The author clearly speaks from her own personal experience and this gives the text credibility and heart. Each day's devotion has just enough information to widen your horizons without getting bogged down. 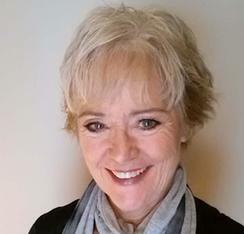 Celeste Cooper urges the reader to cope and to find meaning in difficult circumstances. The reviewer for Reader's Favorite, Jean Hall, did an excellent job in capturing the essence of what we offer our readers who are struggling to manage and cope with chronic pain. It is obvious that her review was based on her experiences with the information, tools and tips we wish all of our readers to explore.